Proving that all is well with his presidency despite the recent controversies, a relaxed President Donald Trump visited the neonatal intensive care unit of an Ohio children’s hospital along with first lady Melania. Trump toured the Nationwide Children’s Hospital, which is known for treating babies affected by the opioid epidemic, on Friday. Health and Human Services Secretary Alex Azar also accompanied the President and Melania. The Trump couple has committed to focusing on the opioid addiction epidemic that is killing tens of thousands of people a year. 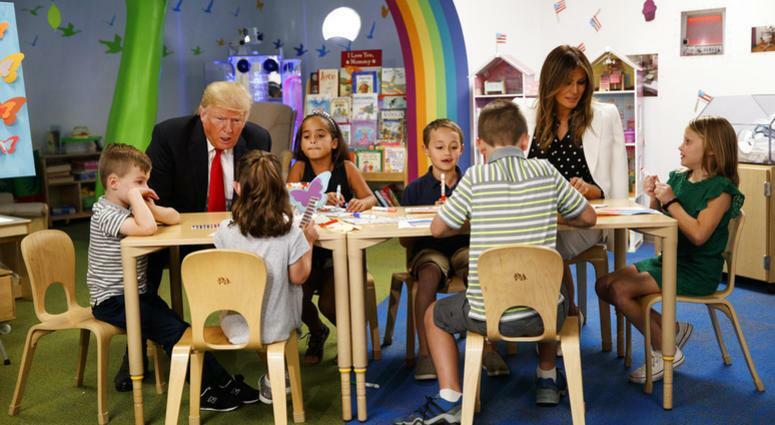 After making the rounds at the medical unit, Trump also spent time sitting with older children as they colored pictures of American flags and hearts using red, white and blue colors. First lady Melania took to Twitter to say it was a “great visit” as she thanked doctors, researchers, and staff who work hard daily to carry out their mission. Trump next attended a fundraiser and delivered a keynote address at the Ohio Republican Party’s state dinner. The President was just in Ohio a few weeks ago when he attended an August 4 rally for U.S. House Candidate Troy Balderson, a GOP state senator. Balderson won the special election to fill the unexpired term of longtime Republican congressman Pat Tiberi. Tiberi left office in January.